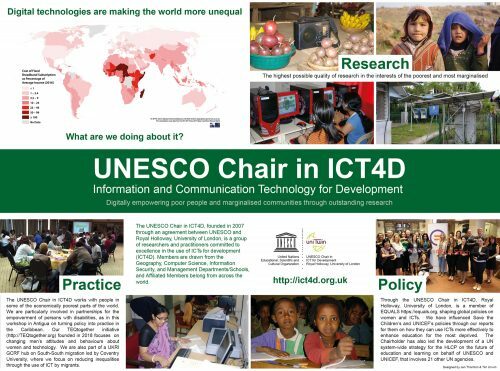 The fundamentals of ICT4D as an area of practice and research have been revisited several times since the early days, emphasising the limits of technological determination, as well as the problematics made invisible by simplistic definitions of the ‘4D’ (e.g. Toyama, 2015). Recent events and issues in what are considered advanced economies open up to scrutiny yet another, deeply embedded view: that advanced and developing economies can be mapped jointly onto geographical areas, separating North and South and distinguishing the advanced economies in Europe, North America and some Asian countries from emerging economies in Africa and Latin America. This taxonomy is infused in the fundamentals of ICT4D as a discipline and has many implications. It also reinforces the donor-recipient humanitarian pattern evident from the beginnings of development practice, by assigning semi-permanent labels to countries and actors that are either on the giving or on the receiving side. The consequences of this have been amply debated, especially by Latin American scholars, noting how being on the receiving end hinders self-directed action towards change. These conceptual categories tend to render us impervious to the problems that are right on our doorstep: Europe, for instance, has been recently facing issues that are central to ICT4D practice and research. The number of people seeking refugee status in EU countries, for example, rose steadily to reach around 1.3 million in 2015 and 2016 (Eurostat). However, the migrant and refugee crisis is just one side of the coin. Europe also faces challenges that are endemic to the continent, some associated with the process of redress after the 2007/08 financial crisis. To this we can add inequalities, social exclusion and marginalisation based on gender, religion and ethnic belonging. Since 2009, I have conducted research with disadvantaged groups in Europe, particularly one of the continent’s most vulnerable populations – the Roma minority. The Roma are widely considered to be the most discriminated and socially excluded European minority group, facing widespread poverty, low literacy and digital literacy, and lack of access to quality education and housing. Numerous efforts and programmes for social inclusion and economic redress have targeted the Roma. Outcomes are often unsustainable and limited, and true change and development have yet to be achieved. In my ICT4D research I have addressed issues around voice, social inclusion and cultural affirmation of the Roma (e.g. Sabiescu, 2013; Hagedorn-Saupe et al., 2015, Ch.5) and brought it in dialogue with the situation of other vulnerable groups across both North and South, most recently, within the EU project EduMAP, which takes a development communication lens to understand how adult education across the EU can better serve the needs of vulnerable youth. What the Roma example points out is that clear-cut distinctions and firm boundaries between developed and developing contexts are illusory. Poverty, inequality and exclusion, along with the issues posed by unequal access to technology and information literacy levels permeate both developed and developing regions. There is thus scope for ICT4D research and practice to contribute to more equal, inclusive, and tolerant societies in all parts of the world. This could be developed in collaboration, bringing together ICT4D and interdisciplinary perspectives for research and practice across regions historically targeted by development programmes, and what are considered advanced economies. It is also important to encourage cross-disciplinary dialogue and exchange through events that link across various disciplinary traditions and geographical areas of focus. These engagements will enable us to devise fresh perspectives on development and look beyond pre-defined categories and labels. Ultimately, a closer, unbiased look at our contemporary societies from multiple disciplinary perspectives compels us to acknowledge that in essence ICT4D perspectives, tools and sensibilities are equally needed across North and South, including what are traditionally considered developed and developing regions. Posted on July 31, 2017 November 17, 2017 by Endrit KromidhaPosted in ICT4D BriefingsTagged Critical, Geography, ICT, Inequality.